Synthetic peptide within Human SSX2 aa 171-223 (C terminal). The exact sequence is proprietary. 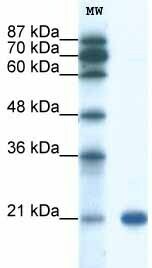 Recombinant Human SSX2 protein (ab116849) can be used as a positive control in WB. Jurkat cell lysate. Our Abpromise guarantee covers the use of ab48571 in the following tested applications. WB Use a concentration of 0.5 µg/ml. Detects a band of approximately 21 kDa (predicted molecular weight: 21 kDa).Can be blocked with SSX2 peptide (ab182921). Good results were obtained when blocked with 5% non-fat dry milk in 0.05% PBS-T. Expressed at high level in the testis. Expressed at low level in thyroid. Not detected in tonsil, colon, lung, spleen, prostate, kidney, striated and smooth muscles. Detected in rhabdomyosarcoma and fibrosarcoma cell lines. Not detected in mesenchymal and epithelial cell lines. Note=A chromosomal aberration involving SSX2 may be a cause of synovial sarcoma. Translocation t(X;18)(p11.2;q11.2). The translocation is specifically found in more than 80% of synovial sarcoma. The fusion products SSXT-SSX1 or SSXT-SSX2 are probably responsible for transforming activity. Heterogeneity in the position of the breakpoint can occur (low frequency). ab48571 has not yet been referenced specifically in any publications. Publishing research using ab48571? Please let us know so that we can cite the reference in this datasheet. There are currently no Customer reviews or Questions for ab48571.